All times are local unless otherwise specified. Look Up! The Moon, waxing and waning, impressively promenades across the dark sky, partnering with the sparkling stars and glowing planets. Who is the Moon dancing with tonight? 12/13-21 ~ Look Up! ~ There's Lots to See! Click on the Moon links for meditative insights and additional information. Note: GC marks the Galactic Center, the Heart of our Milky Way Galaxy. The New Moon can be thought of as a no Moon! Its sunlit side is facing away from Earth toward the Sun. The side that is facing Earth is not getting any sunlight, leaving it dark and invisible to us ... no Moon to see! A New Moon lies between the Sun and Earth. Helpful Image + Description BTW: The only time a New Moon can be seen is during a solar eclipse, when it passes directly in front of the Sun, visibly showing off part or all of its entire dark disk. Note: For those living in San Francisco this New Moon takes place above the eastern horizon about 2 1/2 hours after sunrise. The Sun, New Moon and planets are located in the same constellations for other parts of the world; these constellations, in differing time zones, lie in a different location above or below the horizon. With every New Moon our soul goes into meditation and aligns with the inspiration of the Nirmanakayas; a potential is enlivened and a seed of consciousness is formed deep within. Take some time to create a sacred space. A new cycle is beginning. The Sun and New Moon are positioned at the legs of Ophiuchus the Medicine Man in the sidereal sign of Scorpio. His arms firmly hold a large serpent, which coils around his body; his legs stand upon Scorpius the cosmic Scorpion. Constellation Image Ophiuchus is also known as the 13th ecliptical constellation of the zodiac because the Sun passes through it annually November 30 - December 17. The astronomical symbol of Ophiuchus is the caduceus--the entwined double serpent upon a staff--the double helix of the DNA. The Sun and New Moon diagonally line up with Sabik of Ophiuchus and the fiery red heart star of Scorpius, Antares. Review map above. In the burning ground of the cosmic Scorpion the dualities of death and life serve each other in evolution's ongoing spiral dance of transformation. The fiery emanations of Antares create struggles that keep our visions current and ensure growth, evolution and change, especially for humanity's governing systems. Nick Fiorenza points out that the New Moon in this longitude also conjoins the shoulder of Hercules and the eye of Draco to the north. 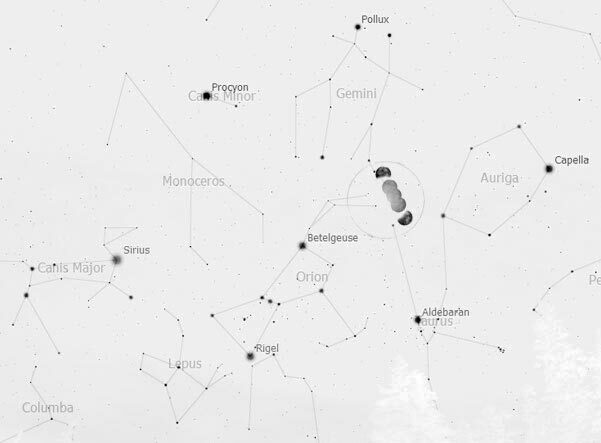 Use this San Francisco New Moon Sky Chart to locate these northern constellations. Review the map above in considering the following. Note: Uranus located at the Circlet of Pisces is not shown on the map and GC marks the Galactic Center, the Heart of our Milky Way Galaxy. 12/5 Mercury conjoins Pluto 5:18pm PST (01:18 UT 12/6). 12/5 Uranus is Stationary Direct 5:51pm PST (01:51 UT 12/6). 12/6 Moon occults (hides) Mars 1:46pm PST (21:46 UT). 12/6 Moon conjoins Pluto 11:24pm PST (07:24 UT 12/7). 12/7 Moon conjoins Mercury 12:41am PST (08:41 UT). Sagittarius the cosmic Archer with Mercury, Mars and Pluto on his bow takes aim, zeroes in on the Light and Whole Truth and knows the way to go. His emanations illumine the useful intellect, allowing intuitive perception to see a new type of goal, one that unifies the dualities into a Divine ONE. The Archer teaches us to aim the arrow of the mind toward the intuition for divine vision and right timing. Mercury messenger of the gods helps us see the divine goal. Mars gives us courage and perseverance to reach it. Pluto helps clear the way "by dismantling that which is not supportive of this higher truth" in our lives. Note: Mercury, Mars and Pluto line up in conjunction above the top of the teapot asterism of Sagittarius Monday, December 13, on the day of the First Quarter Moon. For orientation review the map above. The arrow of this cosmic Archer is aimed toward our Galactic Center (GC). The Archer and his three planetary companions, are bound for the expansive, bulging Heart of our Milky Way Galaxy. This celestial cavalry is leading humanity beyond its mortal limits of duality toward its spiritual inheritance of the Divine ONE. BTW: With Uranus Stationary Direct December 5/6, we are bound to experience less explosive willful dogma and more regular flowing intuitive and inventive impulses during this lunar cycle. This New Moon brings us into a healing contact with the initiatory forces of Death and Life. As a spiritual being in a human body, each of us is born to be the master of the changes in our life, to create well-being. Over time the death and life (change and rebirth) of our earthly manifestation becomes our responsibility. During Sagittarius the healing emanations of Ophiuchus the Medicine Man, a master of these initiatory forces, reach us on the warm rays of sunlight. Take some time each day to feel these rays guiding you through change, establishing well-being in your life and even illuminating your cellular patterns. Call upon Sagittarius the Archer and his three planetary companions when change is at hand. This celestial cavalry reveals the divine vision and the way to achieve it. Full Moon during Sagittarius, begins with this New Moon. The Light of Life Itself We Know The One. Review the New Moon's Sagittarius reflections above. Jupiter Is Brilliant ~ Luna Is Growing ~ Find Celestial Santa! How Many Seasons of Stars Can You See? Shooting Stars Fly from the Gemini Twins! Note: The blue dot at the feet of Gemini, just east of the 12/20 nearly Full Moon, marks the intersection of the horizontal ecliptic and the vertical Milky Way. It is called the Gate of Man, the place where souls enter into incarnation. East ... The Winter Triangle nestles within the Great Winter Hexagon. Can you locate the 7 brightest stars that make up these geometric gems? Look Up! What can you see? Navigate with Orion! See Celestial Santa? Look to the east and above the 12/20 nearly Full Solstice Moon in the map above to see Santa. The constellation Auriga and Santa are closely related. At midnight, when Christmas Eve turns into Christmas Day Santa can be seen high overhead between the North and South Poles! By sunrise Santa's work is done and he disappears in the west! Shooting Stars ... The plentiful Geminids peak the night of December 13/14. The shower lasts for days, so you can view them before and after peak performance. Look east toward the Gemini Twins 9:00pm, when night becomes morning the Twins move overhead, high in the south. 12/14 1am Map The Geminids produces fireballs and colorful shooting stars (perhaps 120/hr, 1/30 seconds). These shooting stars have a mysterious origin. View the sky horizon to horizon. Vary the sky chart's time and date. Generate Sky Charts for your area. Just enter your zip code! The First Quarter Moon, exact December 13, Monday, at 5:59am PST (13:59 UT) squares the Sun at a 90-degree angle and brings up a tension between desires and emotions, as we struggle for fulfillment. Ideally any obstacles impeding the awareness conceived at the New Moon, Mastering Death and Life, Change and Well-Being, are overcome at this time. First Quarter Luna can be seen in the day sky Sunday and Monday, December 12 and 13. When will you first see Luna? She rises in the east at noon, is overhead at 6:00pm and sets in the west at sunrise. BTW: December 13 Mars, Pluto, and Mercury retrograde are within 1º of an exact conjunction 8:10pm PST (04:10 UT 12/14). First Quarter Luna, Jupiter and binocular Uranus are all in conjunction with each other at the circlet of Pisces, the constellation of the World Savior. It is interesting to note that Pisces, lies beneath the Great Square of Pegasus, which the ancient Babylonians called "The Doorway to Paradise." Review map above. Today astronomers travel through this doorway or "window" to the edge of our Milky Way Galaxy and go beyond to other galaxies! Likewise, the Doorway to Paradise opens, and new dimensions of reality are experienced, when the Light of the World, the World Savior, frees humanity from subservience to the form, ending forever the darkness of matter. The location of the Quarter Moon, Jupiter and Uranus brings to mind the Christ, a master of death and life, change and well-being. Jupiter is brilliant and illuminating in this celestial position, for it is the brightest light in the night sky until it sets. The giant planet is ultimately bound to be light for our world, expanding our hearts and minds. The call to humanitarian service is strong with Jupiter at the circlet of Pisces. In this location Uranus also sheds its light upon our world by surprisingly shifting humanity into a new reality with new visions of the greater whole, freeing us from the outdated, limited form-life. This cycle's lunar theme aligns with the mastery of the Christ. The First Quarter Moon marks the movement from inspiration into action. Action during this lunar cycle involves intuitive vision, transformative events, partnerships, cooperation and service. We are all at the doorway of life and death. What must change (die) within us to create well-being (new life) in our world? December 14-15, Tuesday-Wednesday, growing Luna continues and completes her journey through the constellation Pisces, east of Jupiter. Enjoy the eye-catching view; allow your heart and mind to expand. December 16-17, Thursday-Friday, Luna transits the constellation of Aries, the birthplace of new ideas. Review the map above for 12/16 and then check out the 12/17 Map. Open to the creative energies that initiate action. Note: December 16 Jupiter is at eastern quadrature, at a 90º angle to the Sun. The Sun is within 3º of our Galactic Center. Open to mind expanding galactic intelligence. December 18-20, Saturday-Monday, the waxing Gibbous Moon passes from the shoulder of Taurus the Bull to the horn tips. Constellation Image ~ 12/18-20 5:45pm Map ~ Review map above. Can you spot the mini dipper-shaped Pleiades (Bull's shoulder) in the moonlight? Binoculars come in handy. Look for red Aldebaran, the eye of the Bull near the Moon. Enlightening Taurus evolves the heart by transforming "desire without goodwill" into divine aspiration, the will-to-good. Open to illumination and spiritual growth. Note: December 18 the Sun, within 1º of our Galactic Center (GC), squares Uranus. New and broader visions of freedom are being stimulated. December 20 the Sun and Mercury retrograde are in conjunction within the center of the Galactic Heart (GC). Open to a reorientation of the heart that encompasses the greater Whole. A Solstice Total Lunar Eclipse! Any Full Moon experience can offer us greater illumination of our essential divinity. Issues worked on since the New Moon come to a climax. If the restrictions of the past have been released during the waxing Moon, then the Full Moon can bring fulfillment. If not, the Full Moon might bring serious mental conflicts, possibly affecting the physical body. North Americans can witness a total lunar eclipse. Choose a time within 12 hours before or after the Full Moon. What was conceived at the New Moon, Mastering Death and Life, Change and Well-Being, review above now comes to fruition and is birthed into the full light of our conscious minds. For those living in San Francisco mid-eclipse takes place directly overhead at 12:17am PST. The eclipse is located among the same stars for other parts of the world, however in differing time zones these stars lie in a different location above or below the horizon. BTW: The Earth's solstice total lunar eclipse is seen as a total solar eclipse from the Moon. Simulation See the total eclipse synched from the lunar surface and Earth. Simulation Thanks Stephen Saber. Weather permitting, the first total lunar eclipse in nearly 3 years can be observed in its entirety by those in North America, Greenland, Iceland, Central America, the Caribbean, and the Pacific. For those in western North America, Hawaii and the Pacific the eclipse begins the evening of December 20. Totality lasts 72 minutes: 11:41pm PST 12/20 - 12:53am PST 12/21 (2:41am - 3:53am EST Dec. 21). A partial eclipse begins 68 minutes before totality and can be viewed 68 minutes after totality. Western Europeans see the beginning stages of the eclipse before moonset; observers in western Asia see the later stages after moonrise. Note: It is perfectly safe to watch a lunar eclipse including the 72 minutes of totality, with your unaided eyes, binoculars or a telescope. Total lunar eclipses come in clusters. There can be two or three during a period of a year or a year and a half, followed by a lull of two or three years before another round begins. The previous total eclipse occurred February 20, 2008. The current total eclipse is the first of 3 occurring in the next 12 months. Lunar Eclipses: 2008 - 2015. Also see Eclipse Frequency. 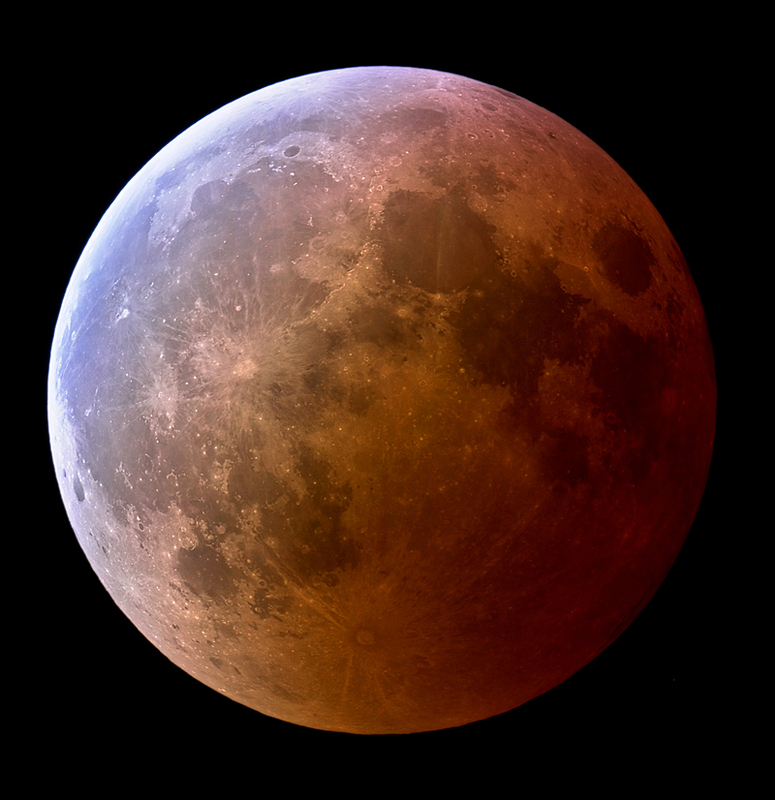 A lunar eclipse is a time of endings, culmination points and major changes. It is a Full Moon with tremendous impact and this one has the additional impact of the solstice energies. Don't be surprised if your anxiety level increases the week before and after this eclipse. Note: Mid-eclipse and the exact Full Moon occur about 15 1/2 hours before the exact moment of the December solstice. The emanations of these two stars, in assisting humanity to reach its full potential also challenge humanity to seek the Whole Truth, to unite the dualities into one divine vision. The Full Moon during the final hours of the sign of Sagittarius is illuminated by the Sun in the constellation Sagittarius. Sagittarius the cosmic Archer takes aim, intuitively zeroes in on the Light and Truth and knows the way to go. He unifies the dualities into a divine re-union. During this solstice Full Moon total eclipse the Moon lies at the Gate of Man, while the Sun lies at the Gate of God. It is written in the heavens. The forces of our solar system and our Milky Way Galaxy are in a rare energetic alignment with each other and the Earth. Also with retrograde Mercury near the Sun and the Gate of God, while residing in the Heart of our Galaxy, our Earth is bound to be uploading potent, expansive, initiatory energies. Juno opposite Jupiter-Uranus, forming a Grand Square with the Sun and Moon, insure rapid change, leaps in consciousness and a reorientation of the heart that encompasses the Truth of the greater Whole. The Earth's shadow, blocking the Moon's reflection of sunlight, along with the energies of Menkalinan and Betelgeuse remind us that this new upload of energies will be challenging to our outdated limited perspectives. However, once these are released with an open heart and mind, we will be able to intuitively zero in on the new visions and enter soulic partnerships that create a world for the good of all. The great wheel has turned, we approach the Solstice and hear the call to meditation by the Guardians of the planet. Rising as one, we respond to answer this call and meet the Light. ... light pours into us. Generate precise times for your area. Yellowish Saturn our Lord of the Rings, is positioned west of (above) bluish Spica the brightest star in the constellation Virgo the Virgin; the much brighter golden Arcturus in Bootes lies north (left) of Saturn. BTW: Blue-white Regulus, the heart star and brightest star of Leo the Lion, lies west of (above) Saturn (not shown in map). Blazing luminous Venus, the goddess of love, positioned in the constellation of Libra the Balance, lies east of (below) Spica. Venus is so bright now it can be seen after sunrise! You won't want to miss this breathtaking wonder in the morning sky. Venus is at greatest elongation (47º) January 8. Mercury the elusive messenger of the gods brightens and rises higher as the weeks unfold. Mercury shines noticeably brighter than nearby, reddish Antares. The whisker thin Crescent Moon joins Mercury at dawn January 2. 1/2 Dawn Map Mercury is at greatest elongation (23º) January 9. Find a flat clear view for unobstructed observations of this planet, star and slim Moon. Binoculars come in handy when first spotting these celestial bodies. Binoculars also make vivid the colors of the stars and planets. The waning Crescent Moon phase brings enlightenment at a deep level, a time of conscious growth, clarification of values and the surrender to a new future. Rebirth can occur and playfulness can come forth. December 28-30, Tuesday-Thursday morning, waning Crescent Luna transits Virgo the Virgin. Tuesday morning, December 28, slender Luna guides us to Saturn. 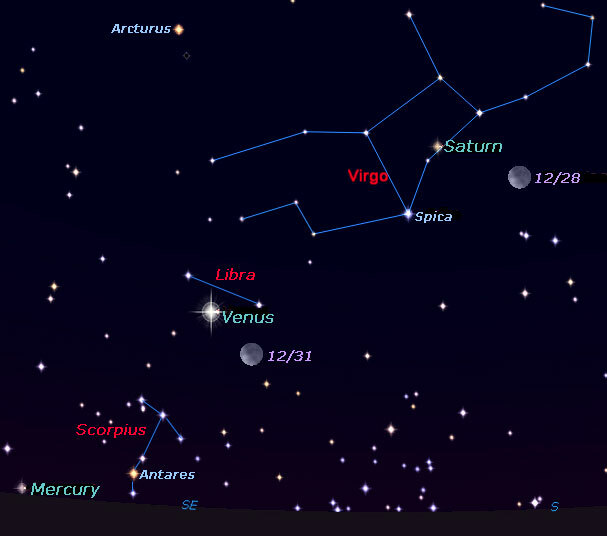 Look for the planet to the left of the Moon and the triangle formed by Saturn, the Moon and Spica. Review map above. 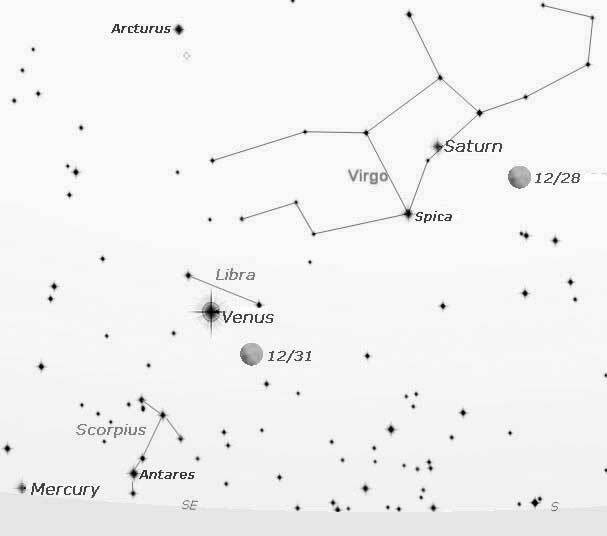 Wednesday morning, December 29, Spica the brightest star in Virgo lies very near Luna; the two form a triangle with Saturn above and Venus below. For orientation review map above. The Moon when located in the Virgin's constellation affirms and fosters a deep growing awareness of the importance of world service on Earth. Saturn in the Holy Grail conceives the structures that exteriorize the unfolding Christ consciousness and cultivate synthesis. This transit of morning Luna is arousing the Higher Power within each and every one of us. We are the sacred Chalice for the Divine Host on Earth. December 31, Friday, New Year's Eve morning, the incredibly bright celestial body next to slim Luna is not a UFO! It's Venus shining at "knock your socks off" brilliance in the constellation of Libra the Balance. Slender Luna and blazing Venus will "WOW" you. Dimmer Spica and Saturn lie above this elegant pair. Review map above. Yellowish Saturn shines slightly brighter than bluish Spica. Binoculars bring out their subtle hues. Highest at midnight, its emanations stimulate our crown chakra. January 1-2, Saturday-Sunday morning, an aging, diminishing Crescent Luna first lies above Antares, then below Mercury in the constellation of Scorpius. See this dawn map for Jan.1 and this dawn map for Jan. 2. Review map above. Scorpius the cosmic Scorpion leads us through a burning ground of death so that we may be reborn to new life like the Phoenix. When Mercury messenger of the gods and the Crescent Moon add their energies to the burning ground, the personality is truly tested, undergoing an initiation that reorients one to the life of the soul and the Divine Plan. This lunar cycle is ending and we are reminded that self mastery and well being are forged in the burning ground of death and life changes, the ongoing spiral dance of evolution. Play your part well! Celebrate HU-manity's birthing process. The Earth and Sun are at their closest Jan. 3.
with Celestial Delights and Treats! Includes a downloadable Moon map and bimonthly star charts. 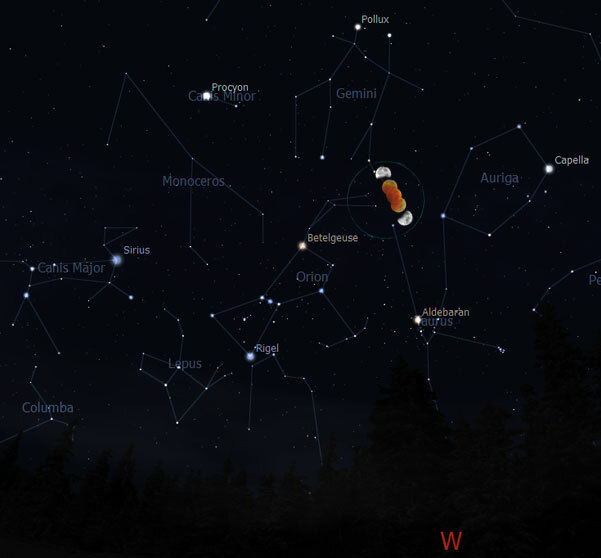 At Skymaps.com download a current monthly guide, evening sky map & calendar. Link to Sky and Telescope's This Week's Sky at a Glance. Spaceweather.com keeps you looking up!